It was the day we waited 364 days for since November 21, 2016; SuperSunday! The Superkarts! USA SuperNationals 21 complete following four days of practice, heat racing, and last chances to make the main events in the 10 categories outside the Las Vegas Convention Center | Westgate Las Vegas Resort & Casino. 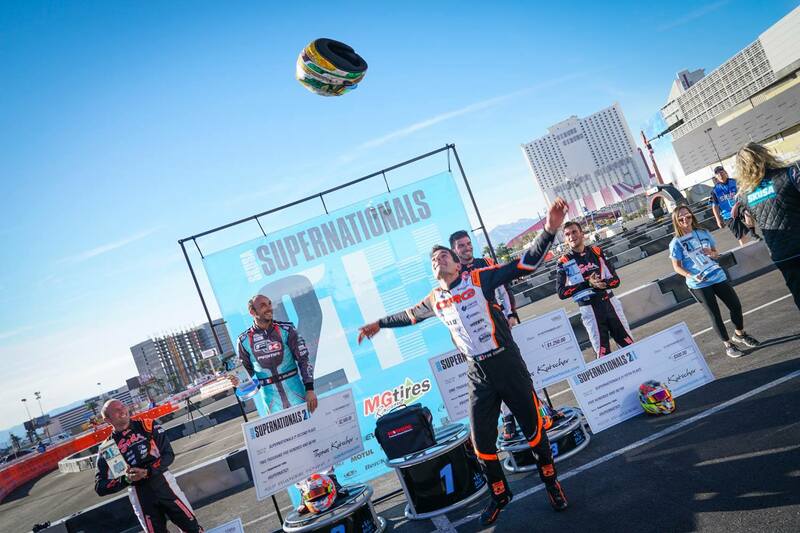 Over 500 drivers from 40 different countries converged to race for the first time on the famous Las Vegas Strip, all vying for the opportunity to be part of history in winning the largest and most exciting kart race in the world. SuperSunday began with the X30 Junior taking to the track first, as they did all week long. Polesitter Jak Crawford (Nash / FA Kart) and Aussie Broc Feeney (RPG / Kosmic) up from fifth place were able to get away from the field with Feeney at the point. With two laps to go, Crawford pulled the trigger and worked past Feeney. The two going back and forth brought in others on the final circuit. 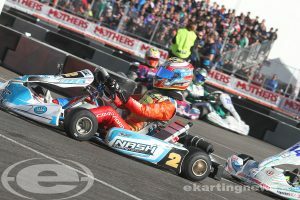 The pressure was on Crawford, however, the SKUSA vice-champion was able to hold on to score his first SuperNationals victory. Feeney tried at the line, coming up four hundredths short. Jeremy Fairbairn (Koene / Tony Kart) advanced up to third from eighth for his first SuperNationals podium. SKUSA Pro Tour champion Dylan Tavella (IRM / Tony Kart) posted the fastest lap of the race, climbing from 19th to fourth to earn the hard charger award. Sebastian Montoya (Tony Kart), son of Juan Pablo Montoya, earning the fifth spot on the podium. Throw in Oliver Calvo (PKS / Top Kart), and the top six finished within seven tenths of a second. SKUSA #2 plate holder Diego LaRoque (PDB) looked to be the driver to beat in the Mini Swift division. Starting on the pole position, LaRoque did not make it around on the warm-up lap, suffering a mechanical failure to sit on the sidelines wondering what could have been. Up front, it was a three driver fight including Rok Cup International Final winner Connor Zilisch (Energy), IAME International Final winner Brent Crews (Nitro Kart) and SKUSA Pro Tour champ Carson Morgan (Benik). Zilisch led early until Morgan took the point on lap six. Morgan was able to hold on to the checkered flag, crossing the line first for the provisional victory. In tech, Morgan’s engine failed inspection with a modified piston, having his win taken away. This promoted Crews to the top spot, only to have his engine fail with the same infraction. Zilisch was then ruled the race winner, giving him two major international victories in a month’s time. 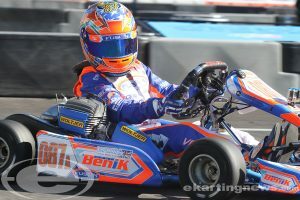 Diego Contecha (Tony Kart) was moved to second with Santiago Trisini (Benik) third. Jeremy Fletcher (Tony Kart) and Guilherme Figueiredo (Benik) – fast lap driver – completed the top-five. Kai Sorensen (Energy) was the hard charger, up 21 spots to finish 20th. The Micro Swift main event lost two drivers in the opening corner. Frankie Iadevaia (Nitro Kart) started outside the front row, and in the shuffle into turn one, had contact with Ian Aguilera (Parolin), pushing the two wide. Iadevaia was able to continue at the tail of the field while Aguilera, starting fifth, was not able to continue. This gave polesitter Mateo Rubio-Luengo (Benik) and Miguel Costa (Benik) the top two spots at the front. They began to fight for position, which brought in British driver Vinnie Phillips (Benik) from ninth, Brandon Carr (Benik) and Caleb Gafrarar (Parolin). Phillips worked his way past Costa and Mateo to take the lead on lap nine. From there, it was a scramble with he and Rubio-Luengo exchanging the lead. That bunched up the field even more, bringing in others to battle for the podium positions. The final lap was just wild, with the drivers all over the track, never making contact and making all the racing mom’s heartbeat increase more and more. When they came around, Phillips was leading and took the checkered flag for the victory. Costa held onto second with Christian Miles (Formula K) took advantage of the wild last lap, jumping from sixth to third in his first SuperNats start. Carr crossed the line in fourth, however was found to have an improper piston and was removed from the results. That put Gafrarar fourth, in what is the first father / son duo to earn podium finishes at the SuperNationals with his father Chuck Gafrarar earning two in the TaG Master division. Rubio-Luengo was then fifth, however, failed post race inspection thus putting last year’s winner Vinicius Tessaro (Kosmic) into fifth. Sebastian Ng (Nitro Kart) earned fast lap honors in his sixth place performance, also earning the hard charger award advancing 24 positions. X30 Senior was the first headline division to hit the track for SuperSunday with Italian Lorenzo Travisanutto (Kart Republic) and Ben Barnicoat (Fullerton) on the front row. The field shockingly made it through the first few corners with no major issues and no one making any low percentage moves. Contact however sent Dante Yu (CompKart) up and over, however, the Senior rookie jumped up, flipped the kart over and got going with loud cheers coming from the grandstands. It was only a few laps later he suffered a broken chain. Out front, Travisanutto settled in to lead the way with Brazilian Olin Galli (CRG Nordam) up to second with British driver Barnicoat third. The Italian put down the fast laps of the race, pulling out to a two-second advantage to earn the provisional victory. A three position jump start penalty for accelerating before the punch off point took the victory away from the Kart Republic brand, making its world wide debut in Las Vegas. That moved second place driver Joshua Carr (CompKart) to the top of the podium, making him the second Aussie to win in the category. Barnicoat was moved to second with Callum Bradshaw (CRG Nordam) up to third. 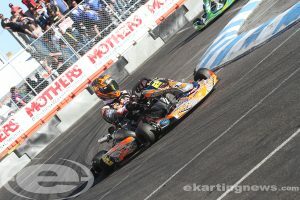 SKUSA Pro Tour champion Ryan Norberg (PSL / Birel ART) won the battle for fifth over Canadian Samuel Lupien (RPG / Kosmic). Last Chance Qualifier winner Austin Garrison (CompKart) earned the hard charger award, up 20 spots to 16th. It looked to be destiny for Ryan Kinnear in the S4 Master Stock Honda category. The Champion Racing / Intrepid driver started on the pole position, carrying the graphics to remember recently passed tuner Alain ‘Frenchie’ Bordes. He drove to victory at the SummerNationals and led the way throughout the 16-lap Final on SuperSunday to claim his first SuperNationals victory. Last year’s winner Gian Cavaciuti (Aluminos) was coming on strong to begin the second half of the race, looking to challenge for the victory until a broken spark plug wire ended his run. Aussie Jason Faint (DKC / Sodikart) came up to second, coming up short at the line to place runner-up. Terry Lawrence (CKR USA) challenged early, eventually finishing third ahead of SKUSA Pro Tour champion Jordon Musser (3G / Birel ART) and Jimmy McNeil (Aluminos). The second headline division was the popular KZ category. The grandstands and fences were packed with spectators, looking to see if Jeremy Iglesias (Formula K) could complete the task of winning his first SuperNationals. The top four of Iglesias, Anthony Abbasse (Sodikart), Paolo De Conto (CRG) and Bas Lammers (Sodikart) were playing a game of poker all week. Iglesias continued to bet into the hand, with two wins on Friday. Two-time winner Abbasse raised the stakes Saturday, stealing the heat race win while De Conto and Lammers stayed in the hand. De Conto waited until the ‘river’ to show his strength. Starting fourth, he was quick early, working to third before working past Abbasse and Iglesias to lead by lap seven. From there, De Conto showed the winning hand, pulling away with fast laps of the race to cross the line for the victory. The Italian became the seventh driver in SuperNationals history to win three races, the second in the KZ category after Marco Ardigo. Iglesias came up short, placing second in his fourth podium at the SuperNationals, his first since 2009. Abbasse ran third with Lammers fourth, ending his run with Sodikart on the podium. 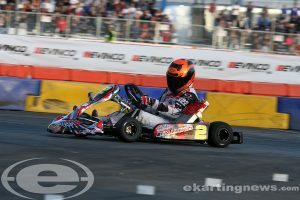 KZ2 world champ Alex Irlando made it three Sodikart drivers on the podium. Mathias Ramirez (Andersen / Birel ART) put on a show, coming from 29th to eighth to earn the hard charger award, showing he has to speed and talent to race against the best in the world. Another emotional win came in the S4 Super Master Stock Honda division. 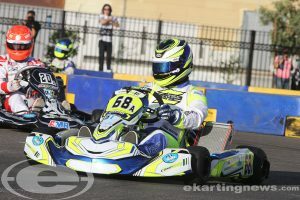 Longtime karter Mike Jones (DKC / Sodikart) led the category throughout the first three days. SuperSunday was his time to shine and after other opportunities coming up short, Jones cashed in this year in his SuperNationals S4 Super Master debut. Jones led the entire 16-lap feature, able to hold off three-time SuperNationals winner Bonnier Moulton (MSquared / Tony Kart). Jones finished the final two laps in tears, and it was a true joy to see him on top of the podium for the first time at the SuperNationals. John Crow (MRC / Aluminos) repeated his third place finish from last year, unable to work past Moulton. Defending winner and two-time SKUSA Pro Tour champion Robert Marks (PKS / CRG) toughed out a broken rib to drive to fourth with Nick Firestone (DRT / DR Kart) up four spots to fifth for a second-straight podium in the category. The S2 Semi-Pro Stock Honda class was another category that was decided after the checkered flag. Polesitter Jason Pettit (Aluminos) led early until Emiliano Salazar (Arrow) took the position on lap four. Pettit came back on lap eight, bringing SKUSA Pro Tour champion Riley Dickinson (DKC / Sodikart) with him. They ran that way until lap 13 when Rory van der Steur (FA Kart) and Salazar made contact, shuffling up the lead group and allowing Laurent Marchandise (CRG Nordam) to move into third. Pettit ran a defensive line as best he could, bunching up the field in the final lap. At the checkered, Pettit crossed the line first with Marchandise able to work past Dickinson, with Collin Daley (DRT / DR Kart) following him through. Officials however handed Pettit a three position penalty for jumping the start, removing him from the victory. That promoted Marchandise to the victory, the second time a non-American driver has won (Dario Capitanio – 2015). Daley was promoted to second with Dickinson in third ahead of Pettit. Salazar completed the top five with sixth place finisher Sky Finley posting the fast time. 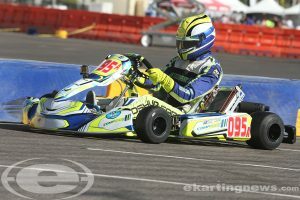 His DKC / Sodikart teammate Graig Alvarez Jr. was the hard charger, placing 17th after gaining 25 positions in the 44-kart field. 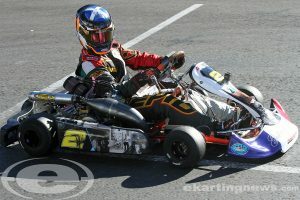 Kris Walton (CompKart) became the second Australian driver to win the X30 Master division in SuperNationals history. Walton started on the pole position and was under heavy pressure from fellow Aussie and two-time winner Kip Foster (KSNA / Praga). Walton secured the lead on lap six after several exchanges for the lead and was able to secure the position until a red / checkered was displayed for a broken barrier dumping on the track. The race ended three laps early, giving Walton the victory, improving from his third-place finish a year ago. Foster ended up second with Paulo Lopes (Kosmic) starting sixth and moving up to third ahead of Matt Johnson and three-time winner Leonardo Nienkotter (CompKart). Nienkotter had fast lap honors while last year’s provisional winner Eduardo Dieter (CRG Nordam) advanced 14 spots to seventh behind Danillo Ramalho (Kosmic). The S1 Pro Stock Honda division wrapped up the 2017 SKUSA SuperNationals with flawless SuperSunday performance by MRC / Aluminos driver Billy Musgrave. The SKUSA #2 plate holder. Jeremy Iglesias (LEM / Formula K) was the lead challenger for the majority of the race until lap 17 when a mechanical failure halted another attempt at earning his first SuperNationals victory. That put SKUSA Pro Tour champion Jake French (DKC / Sodikart) into the challenger position. Musgrave did not put a wheel wrong, and reached the checkered flag first to earn the S1 victory, brining his SuperNats win total to two, earning the S2 triumph in 2012. French settled for second with Gary Carlton (LEM / Formula K) up to third after starting eighth. 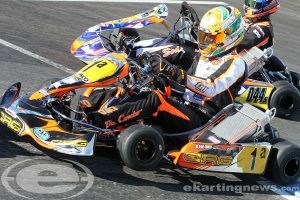 Paolo De Conto (CRG Nordam) crossed the fourth, however, was penalized several positions for contact with Kyle Wick (RPG / CRG). That moved Matt Hamilton (Aluminos) to fourth and Aussie Joshua Fife (Energy) to fifth. Cambrian Go-Karts / Sodikart driver Nic LeDuc was hard charger, up 16 spots to seventh behind two-time winner Danny Formal (Champion / Intrepid). Mathias Ramirez (Andersen / Birel ART) has fast lap and was running fifth until breaking a chain.